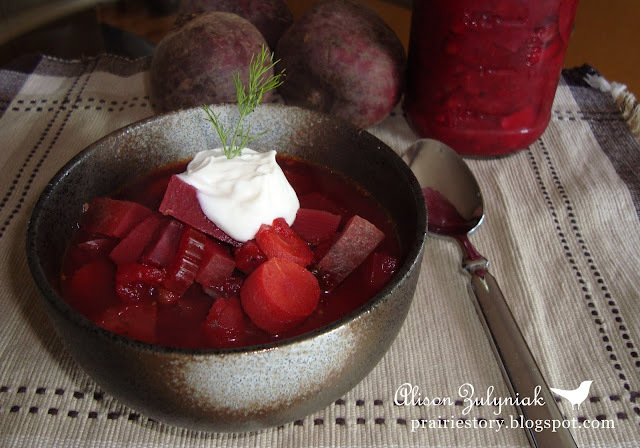 "Cheap like Borscht" ...what a great saying that refers to this hearty soup with its' main ingredients being beets and water. I grew up with my Grandma making Borscht out of vegetables from her garden. I'm sure anyone with Ukrainian or Polish or Russian ancestors share similar memories and will always have a special spot in their belly for Borscht! I recently remembered how as kids we'd go ga-ga over Grandma's Borscht and then thought perhaps my 1 year old would like it as well as I've been trying to get him to eat more veggies. He LOVED it. Borscht is not a picky soup, so don't get caught up on the measurements. Just get it all in the pot! - Dollop with sour cream when served. Very nice! Such a simple sounding recipe. I'm not used to such a chunky version, but will have to give it a try next time we have some beets lying around! I love borscht, I'm of Ukrainian background and my Baba made it all the time for us. I haven't made it in ages but will now. Thanks for the recipe. I went to Ukraine this summer so am excited to try this recipe! Can't get enough beets! Mmmm, I love borscht! How cool that you put peas in your borscht. My grandma make the best "barszcz" in the world ;) I really like your recipe. I always forget how good beets are until I see a great recipe like this. I've never had Borscht but this looks really good. I'll have to pick up some beets at the farmers market next week so I can give it a try. I have been looking for a easy and simple recipe for a long time .Thanks for the delicious recipe. I shall try it mmmmmm. What kind of peas and beans do you use in this recipe; and do you add the vinegar at the end after everything has cooked, or along with other ingredients? Sounds delicious!